This caramel apple pumpkin pie is a twofer for those of us who love both apple and pumpkin pies. Both great flavors layered together in a flaky, rich crust. I used apples that kept their shape when I caramelized them, so they would add a bit of texture to the pie. Go with Granny Smith and Braeburn or a local apple that you know stays firm when cooked. These days all grocery stores have sugar pumpkins stacked up in the produce aisle, so you can roast your own. It is seriously easy and the taste is heavenly. Having said that, you can also use your favorite canned pumpkin puree. I am about to give up some of my chef cred with this next statement, but I did a blind taste test of canned pumpkin and I was very surprised by my taste buds. Out of 5 different brands, the hands down winner was Libby’s. They are not paying me to say that, nor did they send me any product. Not only did Libby’s have the sweetest, most “pumpkin” tasting canned pumpkin, but when I looked at them all side by side, it was the most gorgeous color. It claims not to have any color added, in fact, it’s just 100% pumpkin, just like the organic versions. I won’t mention the other brands to avoid, but some were dull, yellow, tasted more like water and had a grainy texture, not good. Pie dough – you’ll only need enough for one 10-inch pie, so you can freeze the rest. Prepare the pie dough according to these instructions, click here. Preheat oven to 350°F. Par bake the crust by lining it with foil and pie weights. Bake for about 20 minutes. 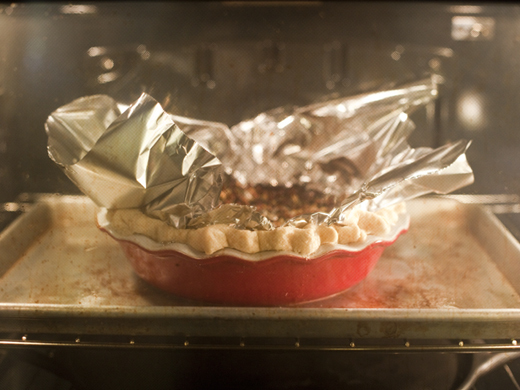 Remove the foil and bake until the bottom crust is set, but not coloring at all. In a skillet, heat the apples, butter, brown sugar, cinnamon and salt until the apples are tender. In a small bowl combine the cornstarch and water. If your apples have a lot of liquid use just 2 tablespoon of water. If they are drier, add the remaining 2 tablespoons water. Stir over medium heat until the apple juices thicken and the cornstarch no longer looks cloudy. Allow the apples to cool while you prepare the pumpkin filling. Whisk together the pumpkin, brown sugar, salt, cinnamon, ginger, nutmeg, all-spice, eggs, sour cream and vanilla. Put the apples in the par baked pie shell. Pour in the pumpkin over the apples. If there are any large bubbles, pop them with a fork. Bake the caramel apple pumpkin pie for about 1 hour, but check after 45 minutes to gauge how quickly it is setting up. You want to take it out when the pumpkin is set and just puffing ever so slightly. You don’t want it to be liquid in the middle, but you also don’t want the pie to soufflé or it will crack. Set it to cool on a rack. Once the caramel apple pumpkin pie is room temperature place it in the refrigerator for at least an hour. The caramel apple pumpkin pie cuts better when chilled and I prefer the flavor. You can try it chilled or at room temperature. Congratulations to Kathy T, she won a copy of Simply Ancient Grains by Maria Speck. Gorgeous pie, I love the layers! I’m all over this – two of my fav pies in one! Oh come on! That’s just too gorgeous. This is such a cool recipe! I love that this takes traditional pumpkin pie to a whole new level! Well this solves the dilemma of Apple or Pumpkin? Both! And yes, I’ll still have two pieces. Great idea. just made this today and my friends and i loved it! 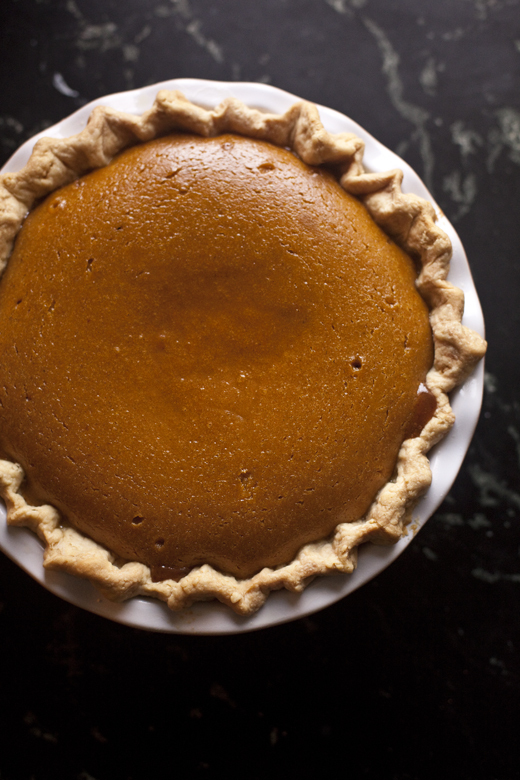 i’m generally not a huge fan of pumpkin pie, and basically because of the texture. but, with the apples, it just made the whole pie perfect! relatively easy to make, not complicated, no unusual ingredients to round up. i will definitely make this again. thanks for the recipe! Yay, thank you so much for trying the recipe, so glad you enjoyed it! Theis is the first time im hosting a thanksgiving meal..and to be honest im terrified.I plan on doing some dishes ahead of time so that im not overwhelmed on D day…can i bake pumpkin pie a day in advance? Yes, you can make this pie a day, or even two, ahead! You might have given me the solution to our age-old Thanksgiving pie debate of apple or pumpkin. Thank you! Zoe, I love this idea. Every Thanksgiving I usually make apple and pumpkin pies so I’m dying to try this. I totally agree with you about LIbby’s pumpkin. I’ve been so disappointed by the other canned brands, especially the organic ones. So tasteless, and a yucky color too. What an amazing, why-didn’t-I-think-of-that idea. Thanks! – Instead of pumpkin puree, should I only put my pumpkin into the oven? Should I grind it after? – I noticed that the pie crust recipe is different in the video and in the written recipe. Which one should I use? Can’t wait to prepare this! Both pie doughs are great and will produce a wonderful pie. I just included the video in case you wanted to see my method. Try the written one and see what you think. this is a little twist on the same pie by mother in law makes every year for thanksgiving! mine never quite measures up (but she uses canned apples, so that’s cheating in my book ; ) i’ll be trying your recipe this year! quick question tho: i don’t have access to lard. can i sub equal amounts butter for the crust? This is seriously the BEST pie I have ever eaten! I’m not crazy about pumpkin pie, but I love apple. Mixed together, it’s like heaven. I made this for an early Thanksgiving with friends and it was a huge hit. I have two in the oven now for family Thanksgiving on Thursday. This looks so appetising! Sounds like a fabulous combination, why have only apple or pumpkin pie when a combination of both is possible. This is right up my alley and a twofer at that! Thanks Zoë, this is beautiful and the photo of the apples had me drooling. Wowee I missed this! What a fantastic pie and I will try this. I usually steam my pumpkin tender but I think I might try roasting it for this. Beautiful! This is a must make pie for Thanksgiving. Hoping it tastes a good as it look! I made this yesterday for our Canadian Thanksgiving yesterday and it was wonderful. The apple and pumpkin is a great combination together. Thanks for the recipe! Thank you so much for trying the recipe, so glad you liked it! Hi Zoe! This looks fabulous. I was just curious though – Do you think it would still work if I used a pre-made pie shell instead? Yes, of course, it will still work, just use whatever your favorite one is. Needed to find something for my pumpkin craving. This looks like it should work. Also realized that I haven’t been receiving your posts. I think I was receiving 2 copies so I tried to unsubscribe from one but I guess it did both. Hopefully, I’m back on the list again. OMG…….this could be the happiest combination of fall flavors ever. I have to ask though, how DEEP is that pie dish? It looks like a very deep, but not that wide diameter dish. My daughter and I are pumpkin pie fanatics during the holidays…but I LOVE caramel apple flavors so I’d try this, but I don’t know that I have a dish deep enough to make it work. Zoe, Do you have a cook book out? I made this tonight and it was delicious! Thank you for the recipe! Thanks for letting me know, so glad you tried it! apples come in various sizes so how many cups woud I use for 5 apples in the caramel apple pumpkin pie recipe? That is a great question. I used medium sized apples and I am guessing it is about 6 cups total. HI! I am hoping to bake this pie this weekend… I have a question – do you think instead of layering it I could mix it all together and bake with a crumble on top? Or does it definitely need to be layered for proper baking? Yes, you can mix it all together and it will be just fine. The apples will likely fall to the bottom anyway, but give it a try and let me know how it goes. This is the best ever dessert recipe I’ve made. All the rave at work. Thanks for making my 1st attempt of baking pie easy and a success! I just made this pie tonight. Should it still be loose in the center. I picked a knife in the center and it still came out loose. I left it in for a little longer and it didn’t seem to make a difference. Is this normal? Or should I put it back in for longer? This looks wonderful! I saw your video on IG and noticed that you appeared to have different fats rather then all lard… could you give the amounts you used in the IG video? looks like mostly butter and lard/shortening.. Thanks so much!! I think I sent you the link on IG, is that right? YAY! Hope you enjoyed it!